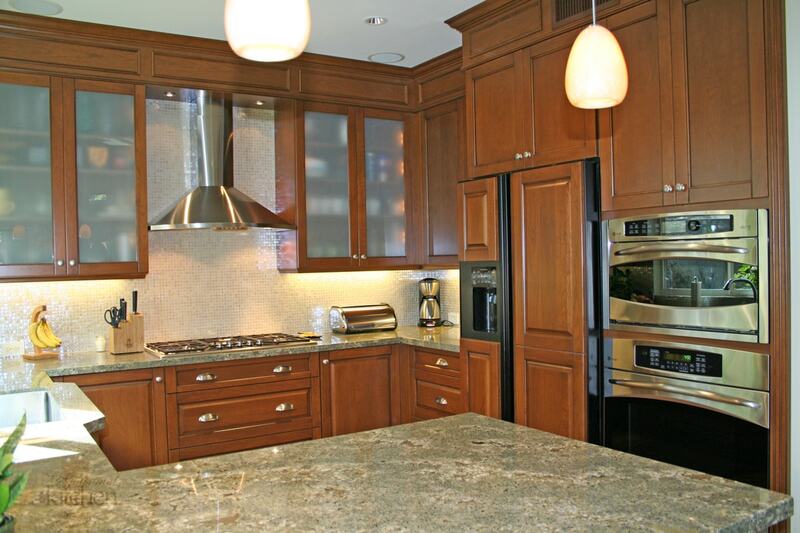 Warm Transitional Kitchen in Tustin | Le Gourmet Kitchen Ltd.
From the cherry wood cabinetry to the open plan design and adjacent wine bar, this transitional kitchen design in Tustin offers a warm welcome to family and visitors. 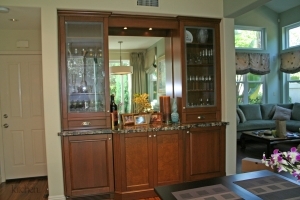 The custom Woodmode and Brookhaven kitchen cabinets offer plenty of storage and have a timeless appeal in this kitchen design. 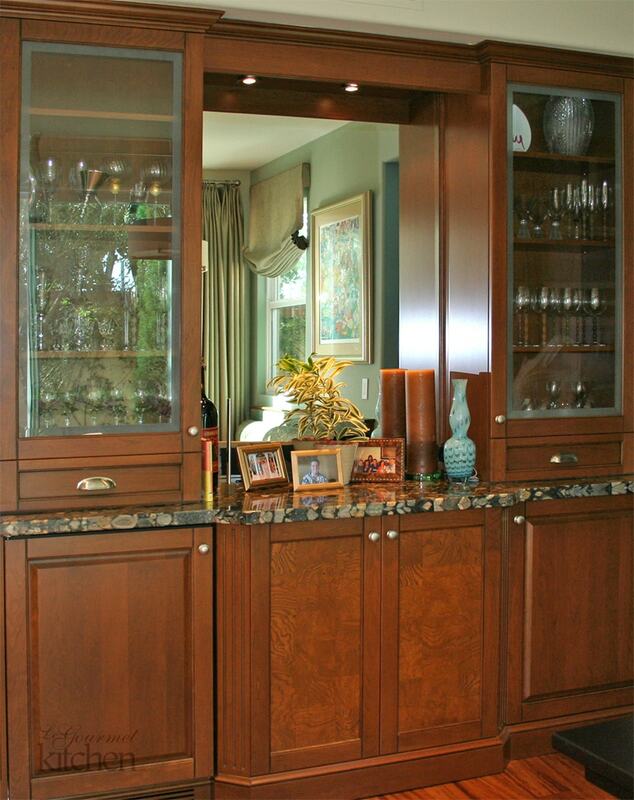 The cabinetry is arranged in a U-shape with a peninsula, bringing extra countertop work space and a division between the kitchen and dining areas in this open kitchen design. 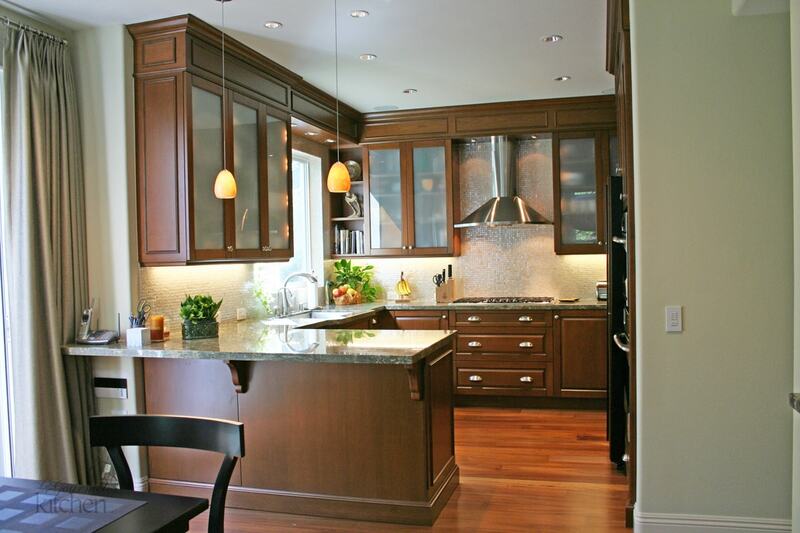 The upper cabinets include frosted glass and open shelves, which add a visual appeal and texture to the design This also helps to make the kitchen design appear more open and bright. The cabinetry is topped off by a beautiful granite countertop, bringing a luxurious feel to the design. 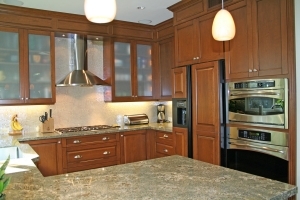 A green glass backsplash offers a bright contrast to the darker hued cabinets. 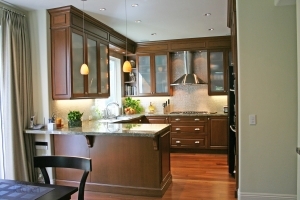 The stainless chimney range hood from Best Ventilation matches the appliances, except for the refrigerator that is paneled to match the kitchen cabinets. A stainless undermount sink with a Grohe faucet continue this theme. 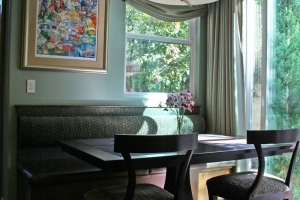 The kitchen work area opens up into a dining, entertaining, and living area. 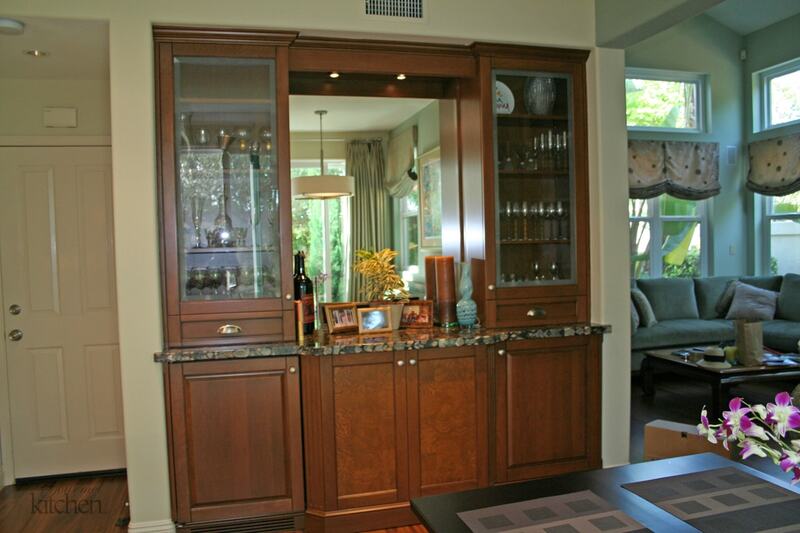 A matching beverage bar is the centerpiece here, which offers the perfect spot to entertain guests. 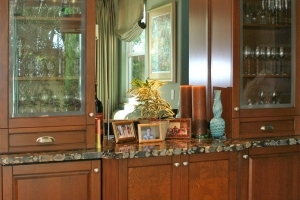 The beverage center includes a center mirror surrounded by glass front cabinets, displaying fine glassware and collectibles. 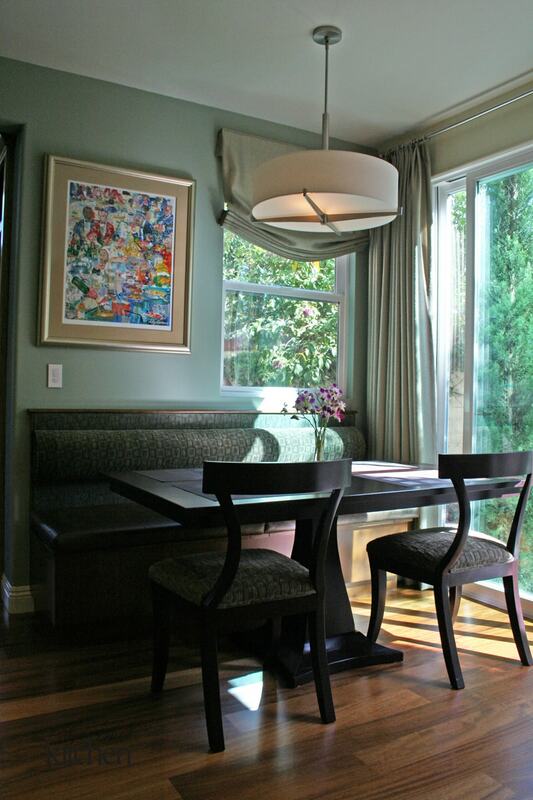 A Lutron lighting system was installed to allow the homeowner to more effectively control the lighting levels, including pendant lights over the peninsula. 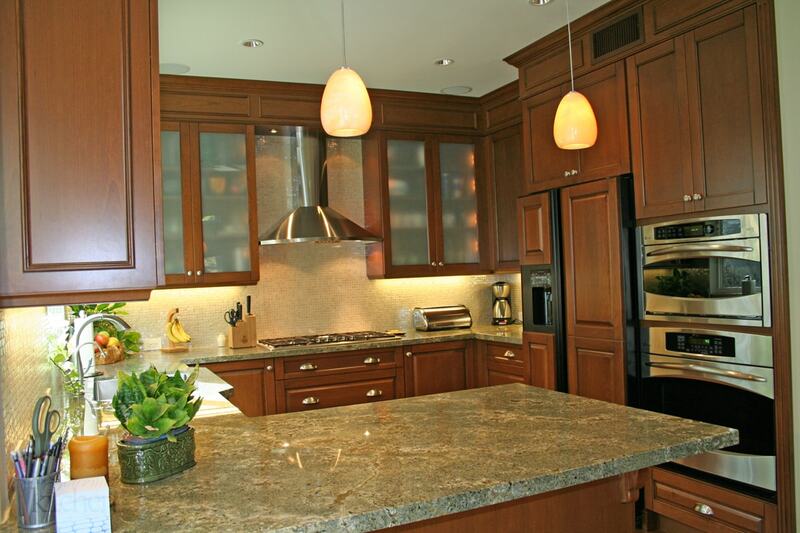 This Tustin kitchen design offers the ideal spot to cook, dine, relax, and entertain, all within a single, open-plan space.